This month you may feel like you’re navigating through murky waters. The Moon card has a lot to do with that which is hidden, beneath the surface, unconscious or undiscovered. There is a strong emotional element inherent in this card. And while emotions are not something easily digested by Aries — particularly the “darker” emotions, such as fear, anxiety and insecurity — it’s necessary to explore them if you’re going to resolve the issues that have been hounding you. But don’t let your imagination run away with you: there’s also some danger of reading too much into things, making mountains out of mole hills or even becoming suspicious or paranoid. Use this time to get in touch with your emotions and to resolve whatever fears and uncertainties you have that have been holding you back. You may be asking yourself this month whether the chains that bind you are external obstacles or self-imposed limitations. It’s often easier to project the blame onto something outside of ourselves than it is to admit we’ve created our own roadblocks. The Devil card speaks of obstacles, restrictions and limitations that keep us from achieving our goals. Sometimes the “darker” side of emotions surfaces with this card: rage, anger, jealousy and paranoia. Addictions and obsessions are a part of this and are sometimes so far removed from our awareness that we suffer from the other Devil Card conundrum: denial. Do you see how the tree appears to be chained to the earth but the chains are not tight, and you don’t actually see where they originate? The raven in the branches: couldn’t he just fly away? This is the message behind the imagery in this card. You can break free of your own limitations, as long as you’re willing to admit they’re self-imposed. Nothing is holding you back but you. Today you should be feeling a mixture of anticipation, enthusiasm and inspiration as you open your eyes to a brand new perspective and see the world as your playground. The Page of Wands card denotes a sort of reckless abandon — being open and willing to embrace all that the Universe has to offer, while at the same time not wanting to be tied down. 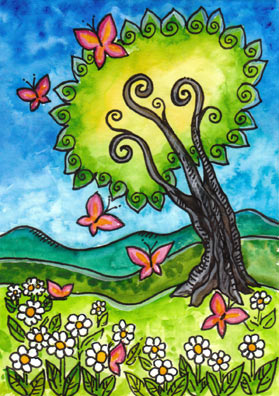 If you look at the imagery in this card, you see a lush green field filled with wildflowers and butterflies. The butterflies playfully flit from flower to flower, ensuring their propagation. The tree leans toward the Sun, basking in its glow. Even the mountains in the distance are lush and fertile. There’s a Joie de vivre aspect to the Page of Wands card. This is a more free-spirited and untethered energy. There’s a sense of being on the verge of something new and exciting — even if you can’t put your finger on exactly what that is. It’s probably not the best time for you to commit to long-term projects of goals. You’ll want to hold off instead and let your ideas mature. t’s a great time for brain-storming, inventing and creating — and not so great for launching a project that is not yet fully formed. This card represents fulfillment and abundance. It’s all about “feeling the love,” which is a reflection of your own capacity to give and receive the same. You’re able to see that what you put out there is mirrored right back to you, as the cup continues to replenish itself from an infinite source. This is a time of giving and receiving: you can derive as much pleasure through giving as you can through expressing gratitude for all that you receive. You may be healing now from a recent crisis. This card refers to the period of silence, stillness and recuperation that is so necessary when chaos and turbulence surround you. The imagery in this card is so poignant. We see a tree that has almost been broken by the weight of its despair, yes has somehow managed to right itself. The four swords propping it up are all sturdy and unyielding. The sky in the background may look ominous, and the leaves may have all fallen and died. Yet the tree itself remains strong and secure — there’s no longer any danger of defeat. This is the essence of the 4 of swords: having come through something so traumatic, you can pause and reflect on all that has transpired before deciding on your next move. You may have to put some things to rest — such as dreams that have died or relationships that have run their course. You may have to veer away from your original course — just like the tree in this card. But taking the time to regroup and recover will make you stronger in the end. You tend to see yourself as in a constant state of becoming — never quite finished and never quite where you see yourself in the end. This is the Virgo dilemma: on the one hand it keeps you working toward growth and progress, but on the other hand you may struggle with acknowledging your own self-worth. The High Priestess card challenges you to look at your own spiritual evolution. You could be a teacher, counselor or mentor for those who seek out your wisdom. You have invaluable insights that you may have felt unprepared to share but now is the time to let go of your fears. This card speaks of acknowledging and embracing your own spiritual essence. Getting in touch with your feminine intuition (notice to Moon in the background) and experiencing both a heightened awareness (the trees branches curling toward the heavens) and a connection to the psyche (the fruit-bearing roots below). This may mark a time of retreat for you too — to contemplate the deeper mysteries of life. You’re at a crossroads now — a turning point — and on the verge of major change. This can take on many forms: it can be a positive and exciting new beginning, or it can manifest as a period of loss and endings. As one door closes, another one opens — just as the wheel turns and the seasons change. This is true of all areas of life: there are just as many ups and downs as there are highs and lows. One day you’re “on top of the world” and the next you’re clawing your way back up from the bottom. Your environment may be changing and you may feel like you’re being pulled along by events that are outside of your control. But believe it or not, you do have a say in the outcome. So many of us just let life happen to us, rather than making it happen for us. You’ll have to look at where the actions you’ve taken and the decisions you’ve made have led you to the here and now. In doing so, and in choosing to participate in your own destiny, you can determine where this next chapter leads. It may feel to you like it’s been all work and no play in recent weeks. This card emphasizes responsibilities and duties which have become priorities, forcing you to deal with them rather than devoting your time and energy to what you really want to do. You’re carrying “extra baggage” now — whether this refers to your own struggles or those of someone else. There’s a strong possibility you’ve taken on someone else’s problems, rather than letting them iron them out themselves. As a result, it may feel like you’re carrying the weight of the world on your shoulders, with no time or energy for to attend to your own needs. The seed of an idea has sprouted, but as you can see it’s getting very little nourishment — even though the Sun is shining in the background. The trees on either side are so tightly intertwined that they’re blocking out all the light. This card encourages you to lighten to load: you’ll have to find a way to nurture your own ideas, needs and interests, or risk seeing everyone else’s problems interfering with your progress. While some people are busy looking at the glass as half-empty, you’re seeing it as more than full. You’re focusing on how far you’ve come and how much you’ve achieved over the last several months. The journey that began with the Fool ends here with the “World,” and a sense of accomplishment, fulfillment and completion. And just like the Fool, you’ve come full-circle, from instinct to essence to progress to development, as you end one cycle and embark on a new one. This card represents endings and new beginnings.You must tie up loose ends and close the door on one chapter in your life — even if that leaves you with feelings of longing or regret. 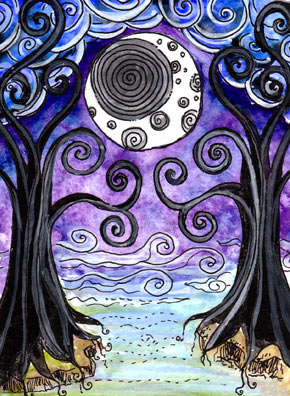 You can see the tree in this card sitting on top of the world, encircling and embracing it. It grows upwards towards the heavens and the world just keeps on turning — just as we must grow and change with the natural rhythms of life. This month you may have to look at ways in which you’ve become your own worst enemy. The 9 of swords can be a “scary” card — until you recognize that most of your fears, doubts and uncertainties are self-created. You may have gotten in the habit of seeing danger where there is none or being irrationally suspicious of others. This can manifest as anxiety, paranoia, intrusive thoughts and even night-mares. Your fears can take on exaggerated proportions if you don’t contain them. If you look at the tree in this card, all 9 daggers have penetrated its trunk, rendering it weak and ineffective. It doesn’t seem capable of righting itself: it’s been beaten by its own lack of defenses — just as you may have let your fears get the best of you. Although this card can indicate a period of needless worry and anxiety, it’s also a call to change your perspective. Replace your fears with faith and you’ll go a long ways toward manifesting the outcome you deserve. You may be questioning earlier values this month as you take a step back and make decisions about what is really important to you. This is a card of transition, but unlike most, this one comes from conscious choice. It’s not a matter of the Universe throwing a curve-ball at you: it’s a decision arrived at though the realization that what once sustained you is no longer conducive to your growth. You may feel alone or abandoned during this time — rejected by a loved one or peers. Yet it’s your own discontent that prompts you to “walk away,” rather than keeping up the pretense that those who’ve let you down were ever truly on your side. You can see the moon (mystery) in this card is shining much more brightly than you’d expect from a crescent moon. The goblets are all standing upright and the vines are starting to grow. This does not speak of loss and endings. It speaks of seeing things much more clearly and using that new-found understanding to pave your own way. A new day (and month) is dawning for you. You’re as ready as you’re ever going to be for a change — especially one that requires you to put the past behind you and prepare for a brand new start. There are elements of anticipation, inspiration and faith in the Universe with this card. Before the Fool can embark on journey, he must be willing to throw caution to the wind and let the day take him where it may. It may not be easy to trust in this process, but the magic that can happen as a result is well worth the effort. Think about where you may be focusing too much on the destination (outcome) and not enough on the journey. You’re undergoing a major transition and this card challenges you to be open to the process, unhindered by doubts, fears or misgivings. The deck used for this month’s Tarot Scopes is the Tarot of Trees designed by Dana Driscoll, used by permission. Please visit the Tarot of the Trees website, where you can purchase this stunningly beautiful deck! This deck is also available for download as an app for IPhone, IPad and Android Devices through the Fool’s Dog website. Don’t forget to check out this month’s Horoscope too! 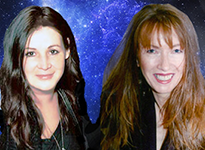 Special thanks too to both The Horoscope Junkie and Top 100 Horoscopes for featuring us on their site! Previous Post: Mercury Retrograde — Here we go Again!